Do they still do character palooza? We did it a couple of years ago based on your recommendation and it was absolutely amazing! OK, now I’m confused. The article said “which characters appear on a given day will always be a surprise, there’s no way of knowing what characters will appear in advance.” I understand your app is dedicated to more than just Character Palooza, but my question is about that event. Can you please clarify? You won’t know who is out on a given day until you see them? Making sure I understand the subscription right…If I subscribe, Character Locator would give me time and location of Character Palooza on the day we’re at Hollywood Studios, but would not have info on which characters would be there? When during the summer is Star Lord ending at HS? Has Moana ever been spotted at CharacterPalooza? It would be my daughters ultimate dream to meet Chicken Little!! I guess he is a rare sighting?? I am so grateful for this information! When we were there last year we were able to meet Aladdin, Jasmine, AND the Genie. They were so much fun! Genie tried to make our stroller fly but accidentally tipped the whole thing over (the kids were not in it.) His reaction was amazing! Lol. My daughter also got to visit with Tiana (her favorite princess). Mary Poppins and Bert were there as well but we didn’t have time to meet them. We used the Character Locator last August and it was absolutely wonderful! Our toddler boys knew everyone. Even the Evil Queen! It was especially a treat to see them before watching Fantasmic and seeing all of the Characters come out. Our boys were squealing “We just SAW them!”. It was an added special sprinkle of pixie dust to our evening. Thank You, Kenny. We can’t wait to use it again next month! Is the Character Palooza ongoing for 2018? 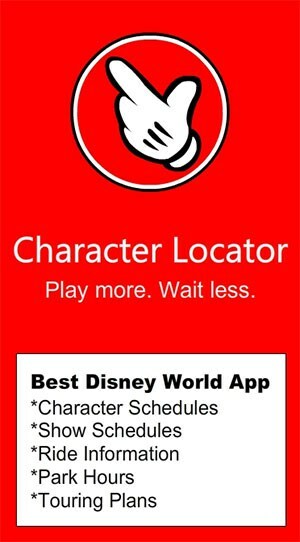 Schedule and full information is on http://www.characterlocator.com as mentioned in this post. Use the Chat Room there as well. Do Paloozas run right through the Holiday weeks (Dec 24-Jan1) or do they put them on hold? I’ve seen it both ways. Sometimes it has occurred and others not. Grace, did you find the character pallooza through Kennys character locator? It is located at the top of the Hollywood Studios listing. 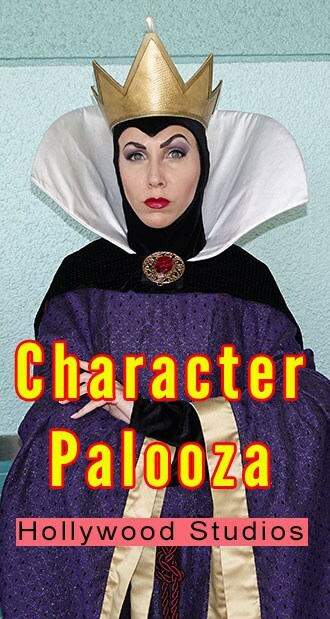 Is the character palooza schedule available each week. I will be in town September 26 through October 02 and would love to catch a few of them. I am trying to find out before subscribing to locator thank you ! We went the other day…. it was amazing!! My sister was so skeptical;. she kept saying that it wasn’t going to happen or that we were in the wrong place…. but then all of a sudden, there were 8 characters…. my husband was ecstatic!! My daughter flipped that Mary Poppins was there, she was jumping up and down, screaming, “A SPOON FULL OF SUGAR HELPS THE MEDICINE GO DOWN! !” so Mary took her hand and led her to her designated spot and they chatted for a few minutes. My sister nearly collapsed when she saw her favorite princess, Mulan. Pinnochio, Pocahontas, Minnie, the Queen, Jasmine & Aladdin were also there. It was an awesome experience!!! 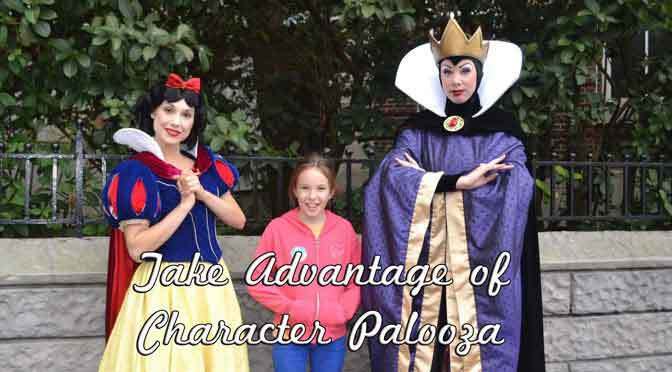 what exactly is character palooza? Were going in february and would love this! If I wait until check-in on December 9th, are my chances good that I will still be able to buy tickets for MVMCP for the 10th, or do the early dates typically sell out as well? Asking because we will be receiving Disney gift cards at check-in as we are staying at CBR and booked that promotion, as well as free dining, so we won’t need the gift cards for dining either. Character questions are handled in the Chat Room of Character Locator. Subscribe, if you wish to have the answers you seek frequently. Is CharacterLocator still operational and accurate?